With two kinds of cheese, cherry tomatoes and Greek dressing, these hand-held appetizers really aim to please. Serve them warm from the oven and watch your brunch guests get in line. Flatten bread slices to 1/4-inch thickness. Press 1 bread slice onto bottom and up side of each of 12 muffin pan cups sprayed with cooking spray. Bake 6 to 8 min. or until lightly toasted. Meanwhile, toss tomatoes with dressing. 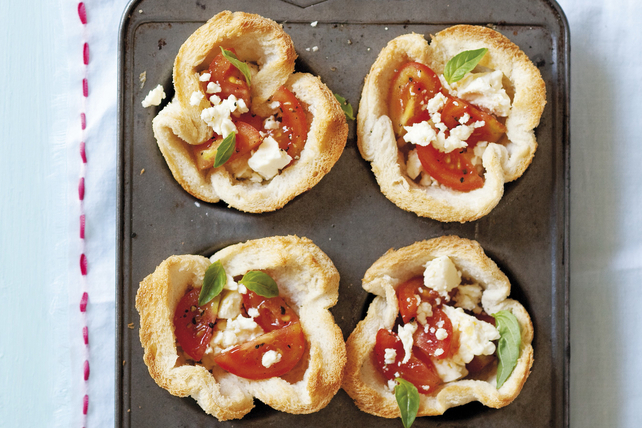 Place shredded cheese in toast cups; top with tomato mixture and feta. Bake 3 to 5 min. or until tomato mixture is heated through and edges of toast cups are golden brown. Garnish with fresh basil leaves before serving. Place trimmed bread crusts in blender, then blend to desired crumb size. Store in airtight container at room temperature until ready to use as desired. Prepare using whole wheat bread slices.